Mangroves are defined as assemblages of salt tolerant trees and shrubs that grow in the intertidal regions of the tropical and subtropical coastlines. They grow luxuriantly in the places where freshwater mixes with seawater and where sediment is composed of accumulated deposits of mud. Mangrove wetlands are normally classified into six types on the basis of the geophysical, geomorphological and biological factors. They are (a) river dominated, (b) tide dominated, (c) wave dominated, (d) composite river and wave dominated, (e) drowned bedrock valley mangroves and (f) mangroves in carbonate settings (Thom, 1984). The first five types of mangrove wetlands can be seen on coasts dominated by terrigenous sediments (shallow marine sediment consisting of material derived from the land surface) whereas the last one can be seen in oceanic islands, coral reefs and carbonate banks. Mangroves of the Maldives belongs to carbonate setting type and within this broad category mangroves of the Maldives are found in four different environmental conditions: i) in the fringe area of some of the islands, where wave energy and wind speed is less and brackish water is present due to mixing of seawater with the margin of the freshwater lens, ii) in between two islands, where the water is shallow and there is accumulated deposits of sediments, iii) along the borders of lagoon that is connected to the sea, iv) along the borders of lagoon that has lost connection to the sea but receives seawater periodically through seepage and v) in shallow depressions, where rain water accumulates. Freshwater enters into all these types of mangroves through surface runoff and underground seepage. These areas normally receive limited amount of terrestrial sediment but they are rich in calcareous sediment or lime mud (marl). Plants of mangroves are generally divided into two groups, namely, i) true or exclusive mangroves species and ii) associated mangrove species. True mangrove species grow only in mangrove environment and do not extend into terrestrial plant community and are morphologically, physiologically and reproductively adapted to saline, waterlogged and anaerobic condition. A total number of 69 species in 27 genera, belonging to 20 families are considered as true mangrove species (Duke, 1992; Bringham and Kathiresan, 2001; Selvam et al., 2004). In Maldives, a total number of 13 true mangrove species are present and fact sheet for each of these species is given in this book. 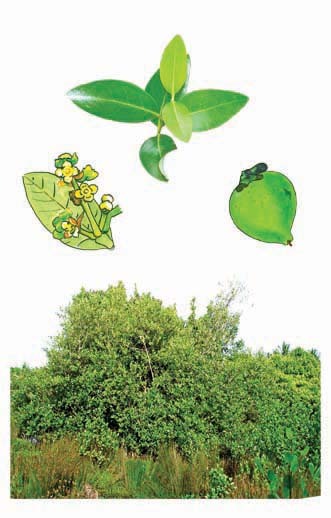 Some of the plants that grow in the terrestrial environment and pure halophytes (plants that grow only in saline environment) are also found within or in the peripheral area of mangrove wetlands. These species are considered as mangrove associates. Mangrove environment is highly dynamic and harsh and mangrove species are variously adapted to cope with these environmental conditions. Breathing roots: Underground tissue of any plant requires oxygen for respiration and in mangrove environment, oxygen in soil is very limited or nil. This necessitates mangrove root system to take up oxygen from the atmosphere. For this purpose, mangrove species have specialized above ground roots called breathing roots or pneumatophores. In some species, these roots are pencil sized and peg like whereas in some other species they look like a knee. These roots have numerous pores through which oxygen enters into the underground tissues. In some plants buttress roots function as breathing roots and also provide mechanical support to the tree. Silt roots: In some mangrove species, roots diverge from stems and branches and penetrate the soil some distance away from the main stem as in the case of banyan trees. Because of their appearance and because they provide the main physical support to these they are called as stilt roots. These roots also have many pores through which atmospheric oxygen enters into the roots. Vivipary: Saline water, unconsolidated saline soil with little or no oxygen is not a conducive environment for seeds to germinate and establish. To overcome this, mangrove species have unique way of reproduction, which is generally known as vivipary. In this method of reproduction, seeds germinate and develop into seedlings while the seeds are still attached to the parent tree. These seedlings are normally called as propagules and they photosynthesize while still attached to the mother tree. The parent tree supplies water and necessary nutrients. They are buoyant and float in the water for sometime before rooting themselves on suitable soil. Mangrove wetland is a multiple use ecosystem. It is considered as a best form of coastal bioshield since it plays a critical role in reducing the impact of cyclonic storms, hurricanes and tsunami on human lives and properties (Danielsen et al., 2005; Selvam, 2005). It also avoids or reduces soil erosion. It enhances fishery productivity of the adjacent coastal waters by acting as a nursery ground for commercially important fish, prawn and crabs and supplying organic and inorganic nutrients. They are also rich in biodiversity and act as habitats for wildlife. Status: Occasional; restricted to northern islands. Only a very few seedlings are noticed. Description: An evergreen shrub or tree 2 to 10 m tall with pencil-sized peg type above-ground roots, which are commonly called as pneumatophores or breathing roots. Bark is whitish to greyish or yellow-green in colour, smooth, often powdery and scaly. Leaves are single, opposite in arrangement, leathery, yellowish-green and hairless above and silver-grey below with pointed apex. Underside of the leaf has special glands for secreting excess salt. Flowers are small, 0.3 to 0.5 cm across, sessile, fragrant, pale-yellow in colour in condensed terminal flower head. Fruit is heart shaped, rounded or sometimes shortly beaked; outer skin is greyish with fine hairs and inside is radiant green or russet brown or dark green. Uses: Leaves are considered as one of the best fodder for camel. Cattle also feed on shoots and leaves during the rainy season when the salt content is low in the leaves. Wood is considered as excellent firewood. Roots and bark are used as stimulant. 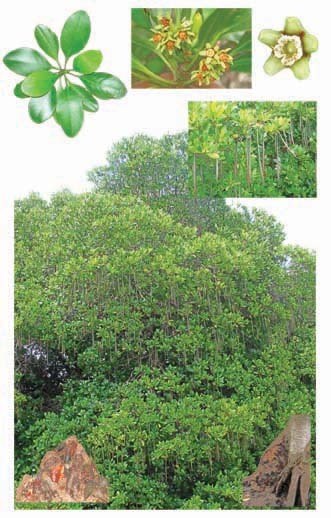 Ecology, propagation and management: Grey mangrove grows luxuriantly in any position in the intertidal regions of estuaries, lagoons (called kulhi in Dhivehi), backwater etc. Though it is capable of growing in sandy soils and rocks it prefers fine clay and alluvial soil for better performance. It is highly saline tolerant and tolerates widest range of soil salinity. Its tolerance to aridity is also high. It can be easily propagated by propagules and the position where it should be planted can be decided on the basis of the distribution of species (zonation pattern) on that location. Propagules of grey mangroves do not look like typical spindle-shaped propagules of some other mangrove species because embryonic axis (hypocotyl) of the developing embryo does not penetrate the seed coat. Hence, propagules of grey mangrove look more or less like normal seeds in appearance and they are called cryptoviviparous propagules. It is produced in large numbers and matured propagules float freely in water and can be easily collected by hand or by a scoop net. They can also be collected from trees. Collected propagules are soaked in brackish water for a day to facilitate shedding of outer coat. These naked propagules are used for plantation. While sowing, radicle (the part of plant embryo that develops into a root) side of the propagules is lightly pushed into wet soil. Nursery raised seedlings of about 30 cm can also be used for outplanting. Status: Common; found either as a dominant or co-dominant species in many of the mangrove ecosystem of the Maldives. It also found in the form of pure stands. A large number of young seedlings are found growing in the areas wherever this species is dominant. Description: A small, erect, evergreen tree 6 to 10 m tall with knee-like above-ground breathing roots. These knee roots comprise a sponge like system of air chambers, which act as an air reservoir when the roots are submerged. These roots are also covered with numerous pores, which allow air but not water to enter the root. Bark is light to dark grey or pale pink in colour and scaly at the bottom. Leaves are simple, opposite in arrangement, lanceolate in shape, about 7 to 12 cm long, shiny, dark green in colour with pointed apex. Inflorescence is a three-flowered cyme with about 1 cm long peduncle and axillary in position. Flowers are small, white in colour with 8-lobed greenish-yellow calyx, which is persistent, forming a cap-like structure above the propagules. Propagules are spindle shaped, 10 to 15 cm long, 0.5 to 1 cm in diameter, smooth, slightly curved, cylindrical and green to purplish-green in colour, which are buoyant and dispersed by currents. Uses: In the Maldives, propagules are consumed after removing the skin and boiling them three to four times, first with ash to remove the bitterness and then with salt for taste. It is considered as a famine food and it was once planted in large areas in some islands, primarily for use during famine. It is also considered as a timber tree. Timber is hard and strong and used for boat building. Timber is normally buried in sand at the edges of the sea for about six months to prevent easy decay. Poles are used for house construction. Ecology, propagation and management: It grows on light, medium and heavy soil but prefers silty clay soil and high- and mid- tidal zone for better performance. Its optimum soil salinity ranges from 8 to 34 ppt. It is propagated by propagules. 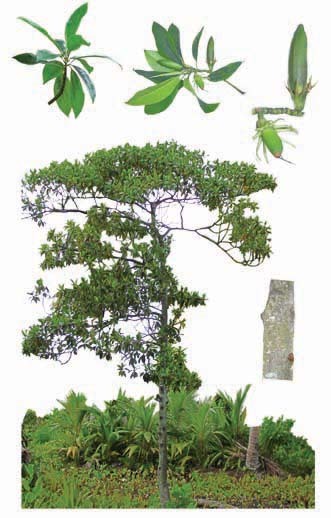 Unlike in Avicennia spp., propagules of Bruguiera spp. are spindle shaped because hypocotyl penetrates the seed coat and elongates (called as viviparous propagules). Matured propagules are purplish-green in colour which can be collected from water or plucked from trees. They can be directly planted in the selected locations by inserting them up to one-third of their length into the soil. Nursery-raised seedlings 20 to 30 cm height can be also used for outplanting. Direct planting of propagules are economical and less time consuming. Status: Common. 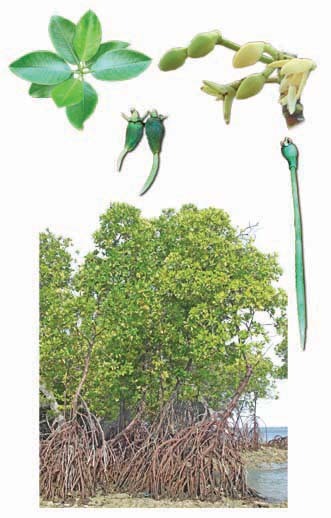 It is found growing as a dominant or co-dominant species in many of the mangrove ecosystem of the Maldives. In some areas it is found in the form of pure stands. Description: A small to moderately sized, evergreen tree that is capable of growing to 35 m tall but most of the trees found in the Maldives are 6 to 10 m in height. It is a single-stemmed tree with short buttresses and characteristic knee-shaped above-ground breathing roots. Bark is pale grey or brown, thick, hard and rough. Leaves are simple, opposite in arrangement, leathery, dark green in colour, 8 to 22 cm long and 5 to 8 cm wide with 2 to 5 cm long leaf stalk. Flowers are single and axillary in position. Calyx is reddish to scarlet in colour with ten to 14 pointed lobes, which are smooth or with grooves above lobe junctures. Petals are orange-brown in matured flowers, bilobed and each lobe has three to four long bristles. Viviparous propagules are cigar shaped, 15 to 25 cm in length, 1.5 to 2 cm in diameter, stocky with blunt narrowed apex. Propagules detach with calyx, buoyant and dispersed by currents. Uses: In the Maldives, propagules are consumed regularly during the fruiting season. They are peeled, soaked and boiled three or four times in water and eaten. Sometimes they are cooked with salt, dried and then consumed. Though the timber is hard and tough it is not widely used because it easily decays. Bark is used for tanning fishing nets. Ecology, propagation and management: It is capable of growing well in somewhat dry and well-aerated soil in the mid- and high- tidal areas of the intertidal zone. It tolerates up to 50 ppt of soil salinity but optimal salinity range is reported to be between 8 and 26 ppt. 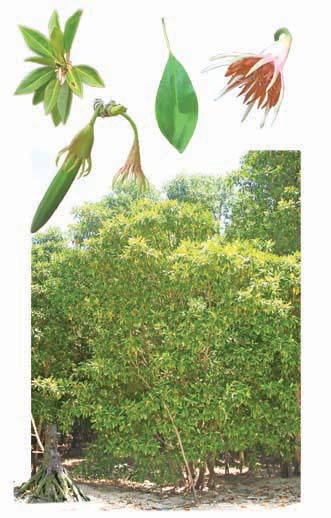 It is one of the most shade tolerant mangrove species and seedlings may grow under a full forest canopy. It is propagated by propagules. Matured propagules are reddish-brown or greenish-red in colour. Fresh and healthy propagules can be collected from the mother trees or freshly fallen propagules without any damage can be used for planting. Propagules can be stored for about a week by keeping the lower portion in brackish water or by wrapping them with wet jute bags. Propagules can be directly planted in selected fields by inserting them up to one–third of their length. Nursery-raised seedlings about 35 cm in height can be used for outplanting. Direct planting is most successful and economical. Status: Rare. It is observed only in Fuvamulah island, where 10 to 12 trees are found growing on the landward portion of a brackish water lagoon (kulhi). These are found growing among taro (cocoyam - Colocasia esculenta) crops where a few wild trees of pond apple (Annona glabra) are also present. A few healthy seedlings are also found in this area. Description: A medium sized, erect, evergreen tree capable of growing to a height of about 20 m but trees found in the Maldives are only about 5 m tall. Single stemmed, multi-branched tree with spreading or diffused crown. Above-ground breathing roots are knee shaped and small buttress can be seen at the base of the stem. Bark is grey in colour and smooth. Leaves are simple, opposite in arrangement, clustered at the tip, elliptic or lanceolate in shape, about 5 to 10 cm long and 4 to 5 cm wide. Leaves of B. sexangula are normally more yellow-green and with shorter leafstalk than those of B. gymnorhiza. Inflorescence is a single flowered pendulous cyme and axillary in position. Calyx is either yellow or yellow-green in colour with 10 to 14 lobes. Petals are white or brown in colour, 10 to 12 in number, bilobed with or without bristles at the tip. Propagules are much shorter than those of B. cylindirca and B. gymnorhiza, about 6 to 8 cm long and 1.5 to 2 cm in diameter, smooth and green to purple tinted brown in colour, detaches with calyx, is buoyant and is dispersed by currents. Uses: Propagules are eaten after peeling, soaking and boiling. Timber, which is hard and strong, can be used for boat building and carpentry work. It yields high-calorific valued fuel woods. 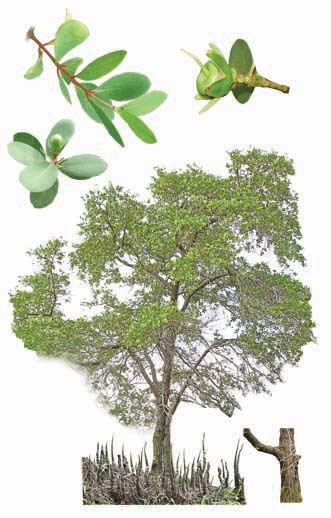 Ecology, propagation and management: It is normally found in the landward zone of mangrove forests and grows well in well-drained medium to heavy textured soil. It is also capable of growing well in waterlogged, deep, slushy and anaerobic soil. Among the six species of Bruguiera it is relatively less saline tolerant and prefers low saline condition for better performance. Propagation is mainly by propagules. As in the case of other Bruguiera spp. matured propagules can be collected from mother trees or freshly fallen propagules can be used for planting. Matured propagules, which are green or purple tinted, can be directly planted by inserting them up to onethird of their length in wet soil and sprouting takes place within five weeks. Nursery raised seedlings of about 20 to 35 cm in height, which is attained in about ten months, can be used for outplanting. Direct planting is the most successful and economical. Status: Rare; found only in Farukolhu Funadhoo island in the northern group of islands. It is present in two to three rows along the boarder of a large lagoon, which is still connected to the sea by a channel. Only a few seedlings are noticed indicating poor natural regeneration. Description: An evergreen tree that grows up to 40 m in height in favourable sites, but most of the trees found in the Maldives are only 4 to 10 m tall. It has short buttress, which originate like stilt roots. It also has knee-like or knobby above-ground breathing roots. Bark is pale grey to reddish brown in colour, smooth in young trees, deeply fissured in old ones and flaky at the bottom. Leaves are simple, shiny, opposite in arrangement and inverted-egg shaped. Leaves are dark green in colour in shade, bright greenish-yellow in full sun and apex is rounded or notched. Inflorescence is a condensed cyme with five to ten flowers and axillary in position. 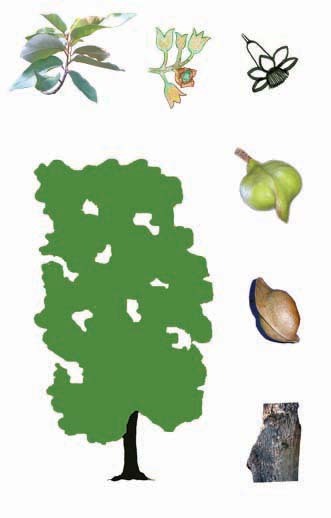 Calyx is deeply divided into five lobes and green in colour. Petals are five in number and white and brown coloured, two lobed and ending in two to four bristles. Viviparous propagules are cylindrical, club-shaped, sharply angular, 25 cm or more in length, 0.8 to 1.2 cm in diameter and green to brown in colour. Surface of the propagules is warty and ridged, buoyant and dispersed by currents. Uses: Bark yields high-quality tannin, which fetches good price in the international market. This tannin is widely used in "batik" to provide warm yellowish-brown colour to cotton cloth. Wood is heavy and moderately durable but in contact with ground it decays in about two years. Wood yields excellent charcoal and good firewood, but has been said to burn with too hot a flame for domestic use. No use is attributed to this tree in the Maldives. Ecology, propagation and management: It prefers mid- and high- tidal areas in the intertidal zone for better survival and growth. In the Maldives it grows in soft, shallow, sandy soil of coral origin and silt and clay is almost nil in the area where it grows. It can tolerate soil salinity up to 45 ppt but optimum salinity range is between 0 and 15 ppt. It is propagated by propagules. Mature propagules can be identified by yellow collar (cotyledon), which may be about 1 cm long or by brownish green hypocotyl. They can be plucked from mother trees or freshly fallen propagules can be used for planting. During plantation, one-third of the propagules is inserted into the mud. Nursery-raised seedlings 20 cm height can be used for outplanting. Direct plantation is preferred because of higher survival rate. Status: Occasional; found on the landward side of the mangroves in some of the northern islands. No seedling is noticed in the areas where the trees are found, indicating poor rate of natural regeneration. Description: A small or medium sized, low branching tree 6 to 12 m tall. Bark is grey, smooth with longitudinal rows of corky air pores. No prominent above ground breathing root is present. Leaves are simple, alternate in arrangement, shiny, leathery with pointed tips and bluntly toothed margins. Leaves are 6 to 10 cm long, pinkish in colour first, turning to green and then to bright red when about to drop off. Male and female flowers are present on separate trees and inflorescence is spike. Male spike is catkin like in appearance, yellowish and up to 7 cm long. Female spike is shorter than male spike. Flowers are tiny, about 0.2 to 0.3 cm across, fragrant with yellowish-green calyx and greenish white petals. It is a not a viviparous tree. Fruits are small, round and clustered. Each fruit consists of three cells and each cell contains a seed. One of the characteristic features of this tree is that when branches and leaves are broken or bark is damaged it exudes a milky sap, which may cause intense pain and blistering, if it makes contact with skin. It can cause temporary blindness, if it gets into the eyes. Uses: In the Maldives, poles are found being used as fencing stakes. Rarely used in roof structures as purling. It is also reported to be used as firewood. Heartwood of this tree was used in the past for burning as incense. In some countries it is a primary pulping species for paper industry and also used in traditional medicine to treat chronic ulcerous diseases such as leprosy. Ecology, propagation and management: It grows well in sandy soil with very low salinity and in these places gregarious monospecific stands with large trunk and profusely branched trees can be seen. Trees with lean stems and limited branches are seen in places where soil salinity is high. It is normally propagated by nursery raised seedlings, wildlings and stem cuttings. Seedlings, which are raised in the nursery from seeds and about 40 cm in height, can be used for outplanting. More than 95% survival has been reported with this method. Wildlings collected and transplanted on the same day also perform well. Stems cuttings 20 cm in length and about 1 cm in diameter can be used for propagation. These cuttings are kept in the nursery for rooting and rooted cuttings with 10 to 12 leaves are used for outplanting. Status: Rare; a single tree is observed in Male. Description: A medium to large sized, much branched, evergreen tree that can attain heights up to 30 m. Presence of well-developed buttresses, which develop into plank roots, is a characteristic feature of this species. They function like air-breathing roots and also provide mechanical support to the trunk. Bark is greyish, fissured and scaly. Leaves are simple, alternate in arrangement, elliptical to obovate in shape, 10 to 15 cm long, dark green on top and very white to silvery white underneath. Inflorescence is loose panicles, up to 10 cm long and axillary or terminal in position. Flowers are small, densely haired and unisexual. Male flowers are smaller than female flowers. Calyx is bell shaped, four to six lobed and reddish in colour. Petals are purplish or brown in colour. Fruit is large, woody, smooth and ellipsoid in shape with a prominent dorsal ridge or `keel". Fruit colour changes from green to brown when mature. Fruits are buoyant and dispersed by currents and when the fruit is floating, the "keel" acts as a sail, aiding dispersal. 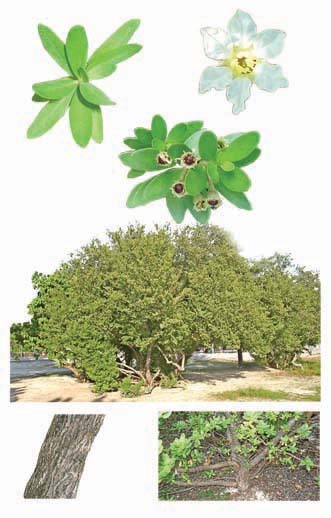 Uses: It is one of the important timber trees found in the mangroves. Heartwood is brown, red-brown or dark red brown in colour, coarse textured, fine grained, hard and strong and takes polish well but is nondurable. It is considered as a utility timber, used for boat building, flooring, furniture, interior finishing and decorative veneers. 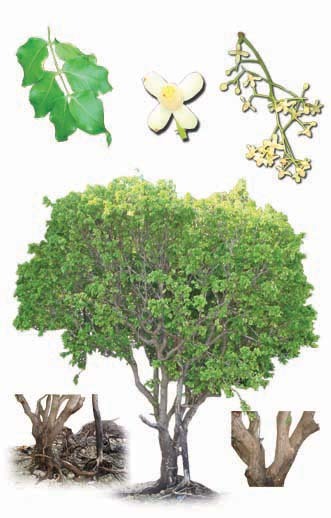 It was informed by some of the elders that in the Maldives, trees of H. littoralis were present in considerable numbers in some of the southern islands but now it has become rare. Ecology, propagation and management: It grows well in the landward edge of mangroves where soil salinity is low. It prefers sandy loam for better performance. It is propagated by seeds and nursery-raised seedlings. Mature fruits, which are brown in colour, become dark brown as soon as they come into contact with water or moist soil. These fruits are collected from the forest floor and used for direct dibbling in containers in the nursery since germination rate of naked seeds is very poor. Germination, which starts in about eight days and complete within 50 days, is nearly 75% when the matured fruits are dibbled. Seedlings attain a height of about 50 to 60 cm in about ten months, which can be used for outplanting and in this method of propagation survival rate is nearly 90%. Status: Common; found along the boarder of closed and open lagoons both in the northern and the southern islands. Natural regeneration is very high. Description: An evergreen, medium sized, erect and much-branched tree that grows up to 10 m tall but in the Maldives most of the trees are only around 4 to 6 m in height. Above-ground breathing roots are normally absent but in moist environments, small looping lateral roots may develop. Bark is grey in colour and fissured longitudinally in older trees. Leaves are simple, alternate in arrangement, small in size, 3 to 7 cm long and 2 to 3 cm wide, succulent, obovate in shape with an indent in the tip; leaf margin is slightly wavy. Inflorescence is spike, 2 to 3 cm long and axillary in position. Flowers are small and erect with green-coloured tube-like calyx, which is divided into five lobes at the tip. Petals are five, white in colour and arranged alternate to sepals. Stamens are ten in number, free, arranged in two whorls, five stamens at the base of the petal and remaining five at the base of the lobes of the calyx. There is no vivipary or cryptovivipary. Fruit is vase-shaped, 1 to 2 cm long, yellowish green in colour, glossy, corky, buoyant and dispersed by currents. Each fruit contains one oblong ovoid seed. Uses: Main trunk provides a hard and durable timber. In the Maldives, timber is used for wooden house construction and sticks of lesser diameter are used for rafters on wooden roof houses. Larger wood is sometimes used in boat building. Stems are used for pushing boats in shallow water. It is considered as excellent firewood. High-quality charcoal is prepared from larger stems. Ecology, propagation and management: It prefers relatively less moist, well drained, sandy soil mixed with clay for better performance. 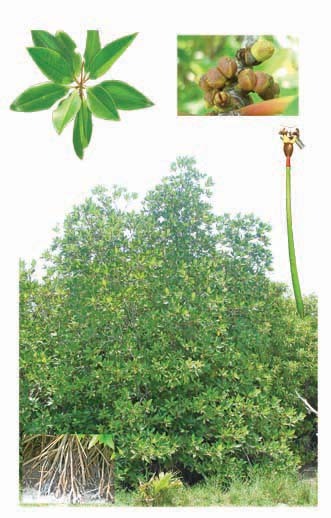 It also prefers relatively higher ground level than other mangrove plants. 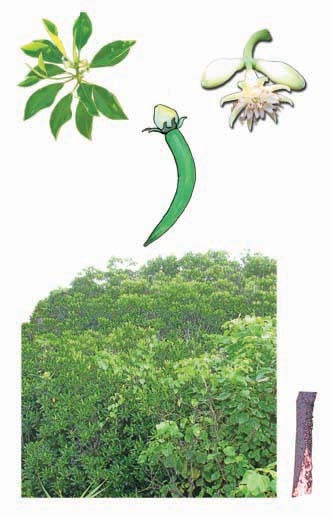 It is a non-viviparous mangrove species and seeds are similar to terrestrial plants. It is normally propagated by nursery-raised seedlings and wildlings. Mature fruits are brown in colour and can be easily collected from trees or gathered from ground. Fruits are normally used for planting instead of seeds. Fruits are sown in a slanting position in containers, keeping half of the fruit inside the mud. Fruits should be stored in wet condition for three to five days before sowing. Germination rate decreases with increasing salinity and no germination will be seen if the salinity increases beyond 25 ppt. Nursery-raised seedlings 20 to 30 cm, which can be obtained within a period of ten months, can be used for outplanting. Pemphis acidula J.R. & G. Forst. Status: Abundant; grows along the beaches of almost all islands and forms contiguous stands in many places. Description: An evergreen, much-branched, slow growing shrub or small tree 4 to 6 m tall with crooked and twisted stem. The lower branches, even though dry, are persistent and rigid, and as the trees grow very closely, they form impenetrable thickets. No prominent aerial roots are present. Twigs are angular and hairy. Bark is light grey to brown, flaky in old trees. Leaves are simple, opposite in arrangement, oblong to lanceolate in shape, 0.5 to 2.2 cm long and 0.2 to 1 cm wide, round or bluntly acute at the tip and hairy on both the sides. Inflorescence is one to a few flowered cymes, axillary in position and hairy. Flowers are white or pinkish-white in colour and 0. 7 to 1.0 cm across; calyx is tubular, 12- lobed, green in colour and hairy. Petals are six, white and inserted between calyx lobes. Fruit is tubular with rounded apex, about 1 cm long and 0.3 to 0.5 cm wide, densely hairy and green in young and brown when matured. Each fruit contains 20 to 30 small seeds. Uses: It is one of the most favoured timbers in the Maldives. Heartwood is very hard, heavy, strong and durable and resistant to wood-boring molluscs and termites. It is used for boat building, particularly for internal beams and pegs to hold together planks. It is also favoured for carved objects such as tool handles (long knife, axe etc. ), chess coins, toys and other handicrafts. It is a preferred firewood but with a very hot flame. Ecology, propagation and management: It grows on a variety of soil including coastal fine sand, coastal limestone rock, cliffs, coral conglomerate, limestone bedrock outcrops of atolls etc. It is able to grow in places where seawater wet its roots regularly during the high tide. It is propagated by seeds, wildlings and roots suckers. Seeds are not directly sown in the field. Nursery-raised seedlings are used for outplanting. Mature fruits can be easily identified by their brown colour and each fruit contains 20 to 30 very small seeds which can be collected by gently pressing the matured fruits. Collected seeds should be subjected to floating test and seeds that float are viable. Seeds may be kept soaked for one to two days before planting in containers. Nursery-raised seedlings 15 to 20 cm can be used for outplanting. Propagation by wildlings is relatively less successful compared to nursery raised seedlings. It can also be propagated by planting straight stems with roots in suitable places. It needs to be pruned to get straight poles. Description: An evergreen, medium sized, much-branched tree that is capable of reaching 20 m height but most of the individuals found in Maldives are only about 6 to 10 m tall. It is characterized by the presence of numerous stilt roots, which are looping from branches and trunk bases and provide support to trees; they also function as air-breathing roots. Bark is grey or dark grey in colour and sometimes longitudinally fissured. Leaves are simple, opposite in arrangement, narrowly elliptic, apiculate (with abrupt slender tip) and smaller than that of other Rhizophora species. Inflorescence is a two-flowered cyme on short, stout, dark grey peduncle and axillary in position. Calyx is four lobed, greenish yellow inside and reddish green outside. Petals are four in number and white coloured; not hairy. Viviparous propagules are shorter than that of R. mucronata, 25 to 30 cm long, green to brown in colour, warty or relatively smooth, buoyant and dispersed by currents. Uses: Wood, which is light weight and less durable, is not widely used. It is sometimes used for docking the boat for repair and poles are used for boat plying. Stilt root, which becomes smooth after removing the bark, was once used for window frames in traditional houses. Though it is an excellent firewood, in the Maldives it is not used for this purpose. Ecology, propagation and management: It prefers deep soft mud for better performance but is capable of growing in sandy soil and coral ramparts. In unfavourable conditions, it develops a straggling or semi-prostrate habit. It is easily propagated by propagules. Matured propagules can be identified by the red collar in the cotyledon. They can be collected from trees or gathered from ground and water. If fallen propagules are used, their surface should be checked for pinholes caused by borer insects. Propagules can be stored for five days in buckets filled with brackish water. Daily dousing with water is necessary to prevent desiccation. Propagules can be directly planted by inserting one-third of their length into sediments. Nursery-raised seedlings can also be used for plantation. Seedlings of at least 30 cm in height and at least with four leaves and kept in nursery for four to five months should be used for outplanting. Survival rate and performance is similar both in direct planting of propagules and planting of nursery-raised seedlings. Status: Occasional; found growing as pure stand or mixed with Bruguiera spp. both in the northern and southern islands. Natural regeneration is found to be moderate. Description: An evergreen, medium to tall tree that may reach 25 to 30 m height. As in the case of Rhizophora apiculata numerous, much-branched, hoop or pile-like stilt roots loop from branches and stems and provide support to trees. These stilt roots also function as above-ground breathing roots. Bark is brown or reddish, smooth and sometimes scaly. Leaves are single, opposite, leathery, broadly elliptic to oblong-elliptic in shape with very distinct black dots on the under surface and tipped with fine spine (mucor). Leaf stalk is 3 to 5 cm long. Inflorescence is dichotomously branched cyme, four to eight flowered and axillary in position; peduncle is slender, yellow and 2 to 3 cm long (in Rhizophora apiculata peduncle is stout and dark grey in colour). Flowers are creamy white, fleshy and fragrant. Calyx is deeply four lobed and pale yellow. Petals are four in number, light yellowish, densely haired along the margin. Viviparous propagules are longer than that of Rhizophora apiculata, 40 to 70 cm long, 2 to 2.5 cm in diameter, cylindrical, warty, green to yellowish green in colour, buoyant and dispersed by currents. Uses: Stilt root, which becomes smooth after removing the bark, was used in the past to make windows of traditional houses. Bark of the tree is used as a dying agent for fishing lines. Dye produced from the bark is very thick and paint like, which makes fishing lines water proof. Wood is light weight, less durable and small in size due to short and crooked trunk. Poles are used for boat plying. Small pieces of wood are used for docking the boats for repair. In many countries very fine quality charcoal are produced from the wood. Ecology, propagation and management: It grows well in deep soft mud, which is rich in humus. It is also capable of growing well in fine sands to coarse stones and coral ramparts. In higher salinity it develops a straggling or semi-prostate habit. It can be easily multiplied by propagules. Mature propagules have light green or yellow cotyledon and they can be collected from trees or gathered from the forest floor and water. Propagules of about 50 cm that have not yet started rooting alone are used for plantation. They can be planted by inserting one-third of their length into the mud. Sprouting completes within three weeks and in ten months it grows to a height of 100 to 125 cm. Status: Occasional; found growing as pure stand with a few individuals both in the northern and the southern group of islands. Description: A small- to medium- sized sized, evergreen tree 8 to 10 m tall with open spreading crown, horizontal branches and slender twigs. Above-ground branching roots (pneumatophores) are peg like, 50 to 90 cm tall and up to 7 cm in diameter with spongy outer surface. Bark is grey and flaky in the older trees. Leaves are simple and shiny; opposite in arrangement, oval to oblong in shape; apex is rounded but with a prominent recurved tip. Leaves are 4 to 8 cm long with short petiole having a reddish-pink base. Inflorescence is one to a few flowered cyme, terminal in position on outer twigs. Flowers are large, 8 to 10 cm wide with prominent red and white stamens; calyx six to eight lobed and green coloured and petals are red. Flowers open only in the late evening, lasting one night only; nectar is plenty in the calyx. Fruit is round but flattened, green in colour, with horizontally extended calyx and persistent long style. Uses: Timber is heavy and hard, resistant to wood boring molluscs and other pests. In the Maldives, it is used for boat building and house construction. Fruit is edible, which tastes like cheese, is eaten raw and relished by children and adult alike. It is also sold in the market. It some countries fruits are used in and for making vinegar. Pieces of pneumatophores are used as fishing floats. Ecology, propagation and management: It is normally found in the places of mangrove wetlands where soil and running water salinity is low. However, it can tolerate soil salinity upto 35 ppt. In the Maldives, it is located mostly around very shallow depressions situated somewhat away from the shoreline. It is propagated mainly by nursery-raised seedlings. Mature fruits detach easily from the calyx and float in the water. They can be easily collected during the low tide and collected fruits can be kept in a heap for a few days to allow the outer skin to rot. After that seeds can be easily separated by squeezing the fruit in water; viable seeds float. These seeds are kept in brackish water for about five days and most of them sink in two days and sprout in five days and then again float with extended roots. These sprouted seeds can be used for sowing in containers in the nursery. Seedlings reach 30 to 40 cm in height within a period of five to six months, which can be used for outplanting. 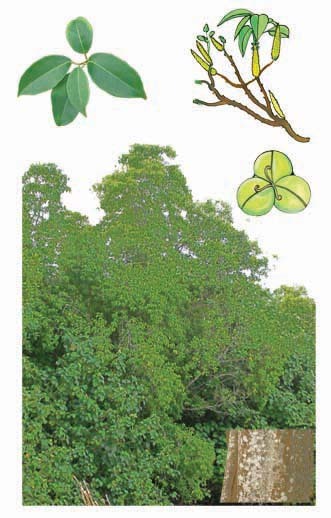 Status: Rare; a few trees are found in the mangrove environment in some of the northern islands. Natural regeneration is very poor and no seedling is noticed. Description: A small sized, evergreen tree that grows up to 6 to 10 m in height. No prominent above-ground breathing root is present (in a related species Xylocarpus granatum buttress and plank roots are present; in another related species Xylocarpus moluccensis buttress, plank and peg-like pneumatophores are present). Bark is brown, rough, fissured and peeling in thick narrow strips. Leaves are compound, alternate in arrangement and leaflets are two to four pairs. Each leaflet is ovate to cordate in shape, 7 to 10 cm long, shiny, green with curled margin and pointed tip (in X. granatum leaf tip is rounded). Inflorescence is a panicle, up to 12 cm long and mainly axillary in position. Flowers are small in size, 0.8 to 1.0 cm in diameter, with four- lobed yellowish-green calyx and four creamy to greenish-white petals. Fruit is round, about 15 to 20 cm in diameter, green in colour, glossy, contains four to ten seeds. Seeds are buoyant and dispersed by currents. 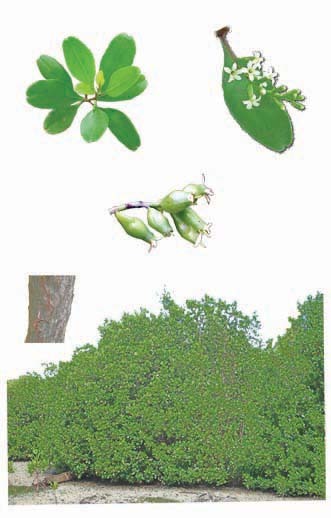 Uses: It is one of the important timber trees of the mangrove forest. Heartwood is brown and red in colour with streaks. Wood is strong, hard and durable. The wood is a good cedar-like timber but long pieces can not be cut because trunk is usually crooked and sometimes hallow. In the Maldives, it is used for boat building, house construction and furniture. It is also widely used as wooden pegs. It is not resistant to termites. Number of seeds in fruits varies from four to ten and they are beautifully interlocked. It is very easy to dismantle these seeds but it is very difficult to put the seeds back together and because of this reason it is popularly called as the monkey puzzle nut. Ecology, propagation and management: It is capable of growing well in deep rich soil and also in coarse stones, rocky shores and coral ramparts. It is multiplied by seeds. Normally nursery-raised seedlings are used for planting. Fruits, which are slightly cracked, are collected from trees and kept in a bucket of water. Mature fruits float and immature fruits sink and rot. Floating fruit gradually break up and viable seeds will float. These seeds are placed in the container, keeping the radicle side down. Germination initiates three weeks after sowing and continues up to 12 weeks and normal rate of success is 60 to 65%. Seedlings, which attain 80 to 120 cm height in ten months, can be used for outplanting. In some cases, seedlings 40 cm tall are also used for outplanting.